Ed Venegas (our lead spokesperson), started our first session with an opening statement in which he stated that the CFI Bargaining Team is ready to press forward on issues that have been proven to be of significant importance to our profession. This day and age, past beliefs and practices which relegated CFI personal to that of third class laborers is not acceptable and will not under any circumstances be tolerated. We expect wage improvements to reflect a true and realistic compensation for the professional work that all CFI employees proudly perform. During our two days of negotiating there was positive movement. We discussed ground rules, and management agreed to withdraw some ground rules that the bargaining team was opposed to. We want to give a big THANK YOU to Emily Hernandez for being part of the Watch and Support. Stand by your Bargaining Committee at the negotiations! We need your support to achieve the best contract possible for ALL! Our unity is our strength by presenting a united front before administration we show our power. Our next bargaining sessions will be October 10, 2018 (in San Diego), and October 22, 2018 in Orange County. Please support your hardworking bargaining team. If you will be participating in the Watch and Support by observing during these bargaining sessions, please submit your time-off request today, and email your team at [email protected]to let us know you will be attending and to reserve your spot. 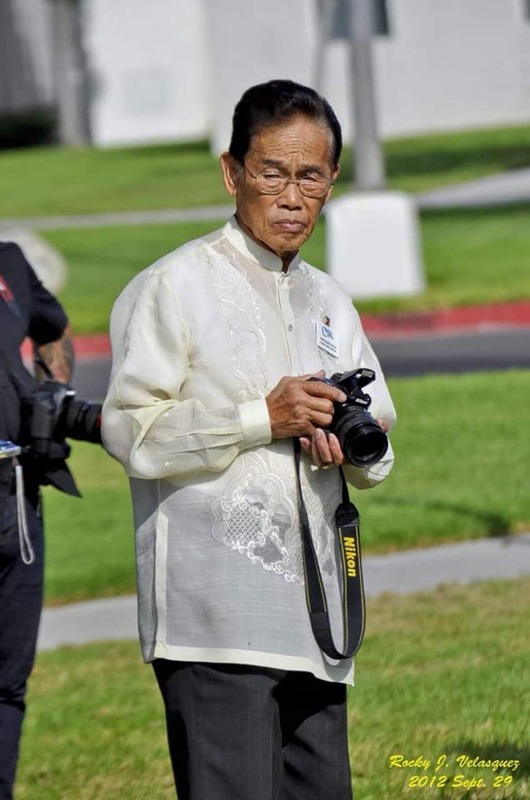 Marcelino Ines, Jr., a beloved Tagalog and Ilocano interpreter in Los Angeles who was a fixture at CFI Conferences and tireless community advocate, passed away on Aug. 20 at his home in Carson surrounded by family. He had suffered a heart attack the previous month. Marcelino was 87. Affectionately called “the Mayor of Manila” by his some of his colleagues, he was born in Stockton, Calif., where his father was farm foreman. He and his family returned to the Philippines during the Great Depression. Years later, Marcelino returned to the U.S. and enlisted in the Navy, serving for 5 years, said his wife Maria Luisa, known as Liling. They married in 1954 having first met as children in the Philippines. “He liked saying ‘I’ve been married for 64 years, to the same lady’,” his wife said. Marcelino began working as an interpreter in the late 1970s after a friend urged him to help with the growing caseload. He had worked for the Los Angeles Superior Court for about 15 years, his wife said. At work, Marcelino shared the plumerias grown in his garden with his colleagues. He was a regular at the CFI Continuing Education Conferences, where he always took to the dance floor with his coworkers. An avid photographer, he photographed much of the 2016 conference, and mentioned that if he wasn’t an interpreter he would be a photographer. He also enjoyed singing and was a member of the church choir and a choral group, said Liling Ines. Marcelino also served on various city commissions, including senior advisory, citywide advisory and parks and recreation. 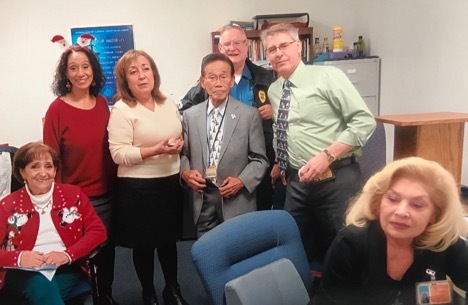 He was a member of the Lions Club member and instrumental in founding the Carson Sister Cities Association and the Sinaitenians of California. Marcelino is survived by his wife; their three children Leilani, Eric and Phillip; four grandchildren and two great-grandchildren. Voting on the contract will be by E-vote conducted by Ballotpoint Elections. Beginning the week of July 23rd. A 7.5% salary increase over the three-year term of the contract distributed in the following manner: a 2.75% base salary adjustment effective the first pay period after ratification; a base pay increase of 2.50% effective the first pay period 12 months after the first increase; 12 months following the second pay increase mentioned there will be a final base pay adjustment of 2.25%. A one-time, non-base bonus payment of 2% to all regular status employees in paid status as of June 30, 2018 effective the first pay period after ratification; this payment will be prorated for part-time employees, and all intermittent part-time and as-needed interpreters will receive a one-time payment of $500.00. Twelve months after ratification, full-time interpreters in service as of July 15, 2019 will receive the following one-time, non-pensionable, non-base payment based on length of service: 1% for 5-9 years of continuous service; 2% for 10-14 years; 3% for 15 or more years of continuous service. Interpreter employees who are certified or registered to interpret in two or more language pairs will receive a 1% salary enhancement for all hours paid for each additional language pair. The Court will make reasonable efforts to make up to 15 hours of CIMCE-qualifying continuing education and training available to each regular status bargaining unit employee at no cost to the employee; this is an increase from 6 hours offered in the previous MOU. The Court has agreed to reimburse all full-time and regular status part-time interpreters the cost of their annual certification/registration fees required by the Judicial Council of CA for each language pair in which the employee is certified or registered. A side letter regarding a reopener on Article 18 (Interpreter Assignments) is included in the MOU which states that the Court will notify CFI prior to making any changes to the interpreter assignment process and will make Court representatives available to meet and confer regarding said changes. Until the parties exhaust the meet and confer process, the Court will continue to abide by the provisions of Article 18, which respects interpreter seniority. Other than the one-time, non-pensionable, non-base payment mentioned in the third paragraph above, the Court was unwilling to offer any other kind of salary increase based on length of service (steps) and to negotiate any further on their offer. We were unable to get binding arbitration language included in Article 9 (Grievance Procedure) or Article 11 (Expedited Arbitration). The Region rejected CFI’s proposed changes to Sections 37.2 and 37.3 of Article 37 (Stewards) and proposed the status quo; their proposal was incorporated herein by reference in their final Comprehensive Package Proposal. They were unwilling to pay for caucus time for the bargaining team in preparation for negotiations (which has been the past practice), and they did not grant travel time for any bargaining member traveling from the Central Coast. We were unable to get the creation of a new classification status for retired court interpreters allowing them to be rehired under California Government Code Section 7522.56. This would have been included in Article 16 (Employment Status). We were unable to get into the contract language which addresses the issue of the docking of “F” status interpreters if they arrive late to an assignment given to them on the same day. Said language was hoped to be included in Article 18 (Interpreter Assignments). The bargaining team feels that there are some important issues that need to be resolved, most significantly recognition of our years of service to the Courts by means of “steps” or a “longevity increase”. We do not feel that a one-time non-pensionable, non-base payment as mentioned in the third paragraph of this letter reflects true appreciation of our services by the Court, besides which it does not help those interpreters who are near retirement in terms of their pension pay-out. As a matter of fact, as our attorney Caren Sencer pointed out to the Region, it holds those employees hostage for a year if they want to take advantage of that one-time bonus. As a result, we are not recommending ratification of this contract. However, because the Region made it clear that their offer would expire that same day, June 27, 2018 at 4:30 p.m., the team felt that that the members deserved the opportunity to let their voices be heard. We believe we have done as much as we can at the bargaining table. In order to achieve more, the members have to be willing to mobilize and carry out concerted work actions. Before casting your vote, please carefully read the proposed contract and consider what you are willing to do to improve it. If the members vote to reject the proposed contract, the Committee will notify the court and we will go back to the bargaining table in an effort to improve the offer. We are not at an impasse and we were not told this was the “last, best and final offer”. Your Bargaining Committee met with Region 1 on Tuesday and Wednesday at the Stanley Mosk Courthouse in the hopes of finalizing a contract after nearly a year of bargaining. Our contract expired on June 30, 2017. At the last session in May we were told that the next available date was not until August 2nd but after vigorous protest from our counsel, we were granted earlier dates. Court Counsel, Ivette Peña, acted as Region 1 spokesperson, as the usual spokesman, Joe Wiley, was not available either day. The key issues that were still in dispute surrounded wages and assignments. As you know, the committee was focused on a wage proposal that additionally included longevity pay (step system). To that end, until the union's most recent proposal, each proposal made by the bargaining committee included a monetary increase in our salary based on service years. As a counter, the Court proposed a 2.75% base salary increase upon ratification; a one-time 2% signing bonus for A and C status employees, and $500.00 for F status. Then in the second year of the contract, a 2.5% base salary increase, and 2.25% base salary increase in the third year. The Court’s final wage proposal also included a one-time, non-pensionable, non-base payment on July 15th, 2019. The breakdown is: 1% for employees with 5 to 9 years of continuous service; 2% for those with 10 to 14 years of continuous service; and 3% to those employees with 15, or more years of continuous service. Concerning Article 18, Assignments, the Court accepted the Union’s proposal which requires a meet and confer between Management and the Union prior to the implementation of the new assignment scheduling system and would incorporate any agreed upon changes into the MOU. Over the course of two days of negotiations, the committee was able to formally Tentatively Agree to provisions in the MOU regarding Leaves of Absence, New Employees, and technical updates to the grievance procedure. The complete contract will now be sent to TNG for review and approval to present to the Region 1 bargaining unit members for a vote. This document represents many months of hard work; however, it is not fully endorsed by this bargaining team with regards to Articles 21 (Salary) and 37 (Stewards). Specifically, the team is not satisfied with the singular one-time longevity bonus proposed by the Court; it does not add anything to the base salary (something that has be neglected by the Court for way too long) and does not truly reflect the value of long-time commitment by the interpreters to the Courts. In Article 37 the issue in contention is the LASC’s failure to follow past practice of paying for caucus time to prepare for contract negotiations … something that has been the precedent over the last 15 years. Thank you Branda Rosas-Almada, Miguel Acevedo, Hernán Vargas, Diana Díaz, Sonia Peralta, James Varese, Marco Larriva, Ismael Carrillo, Chi Choi, Sandra Rodríguez, Ana Placencia, Karmele Landaribar, and Irene Luévano for showing your support by attending the session(s)! The presence of so many members visibly impressed temporary spokesperson, Ivette Peña. Be attentive for updates regarding the TNG approval process and bargaining unit contract ratification vote.